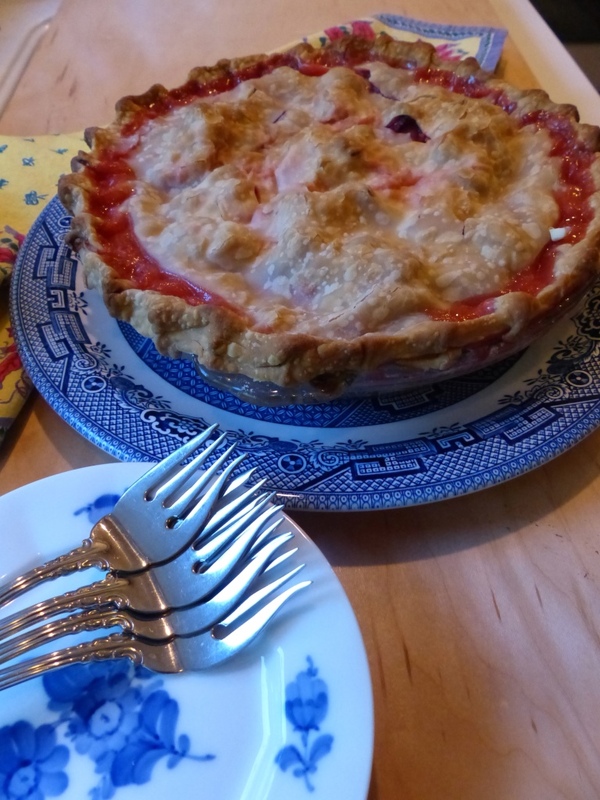 Strawberry – Rhubarb Pie for Bastille Day picnic! Well, here I go again with one of my favorite holiday recipes. My husband adores this pie and so, I daresay does everyone in our family! To begin, I sent John into the lower garden to see if the rhubarb was ready to harvest, and he came back with enough for a few pies! Since I needed the perfect strawberries to go with our homegrown rhubarb, I went to the freezer to look for some of our very precious strawberries preserved for this very purpose! These are not just ordinary strawberries but, super, tasty, sweet ones from the Finger Lakes region of New York where I grew up. My Cousins Frank and Judy, who live in the Finger Lakes area, were so dear to freeze some of these berries for us to take home. So, just before Bastille Day, I set out to prepare my signature pie from the best ingredients available! I will let you in on my recipe. It is simple and easy. I have to admit to you that sometimes, like today, I cut corners with Pillsbury, ready-made frozen pie crust. I always roll out their crust, top and bottom, to the thinnest I possibly can. Preheat oven to 450°F degrees. 2 plus cups of rhubarb – even another 1/2 c.
Wash well, cut into smaller than bite size pieces. 2 plus cups of ripe strawberries – even another 1/2 c.
Wash well, pluck out the stem and cut into similar size pieces. Combine the two fruits in a large bowl. Stir well, mixing all ingredients. Pour into bottom pie crust in a 9” oven- proof pie dish. It is good to heap up the fruit so it stands well over the height of the pie plate. It will cook down in the oven. After rolling out the top crust I fold it twice and cut two slits on each side so that when you spread it out over the fruit you see several decorative steam holes. For easy clean –up I place the pie on a cookie sheet lined with aluminum foil to catch any drips during baking. Bake for 15 minutes at high heat (450°F). Reduce heat to 375°F immediately after the timer goes off. Bake for about 45 minutes or until you see the juice bubbling through the slits in the pie- crust. The crust will be slightly browned. Remove from oven to cool before tasting. It is juicy when eaten warm, and more congealed when eaten cold. It may be served with ice cream naturally! It is always good the next day if there is any left! John has been remodeling our patio into a traditional porch to match my grandfather, Harold Lewis Jones’s 1909 porch. Thus, since the floor is finished and I have some new wicker furniture, we shall enjoy our pie on the porch with our good friend, Leonore, to celebrate le quatorze juillet. Enjoy! Vive la France! Vive les Etats Unis!